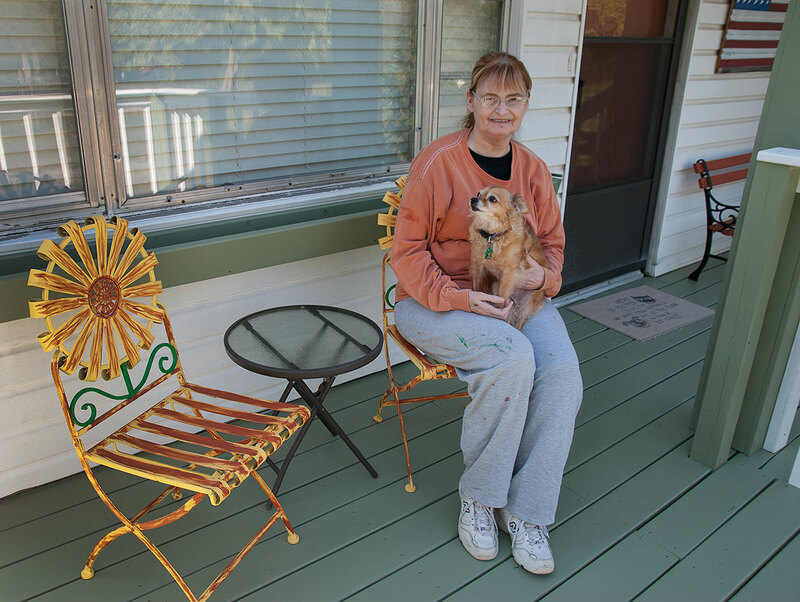 Abby and Sierra sit on the newly-rebuilt front porch and deck. I primed the chairs and painted them yellow, then Abby added the green to the leaves and the orange streaks, which I think was a great artistic touch. I happen to think Abby looks extra cute wearing one of my old long-sleeved painting shirts. 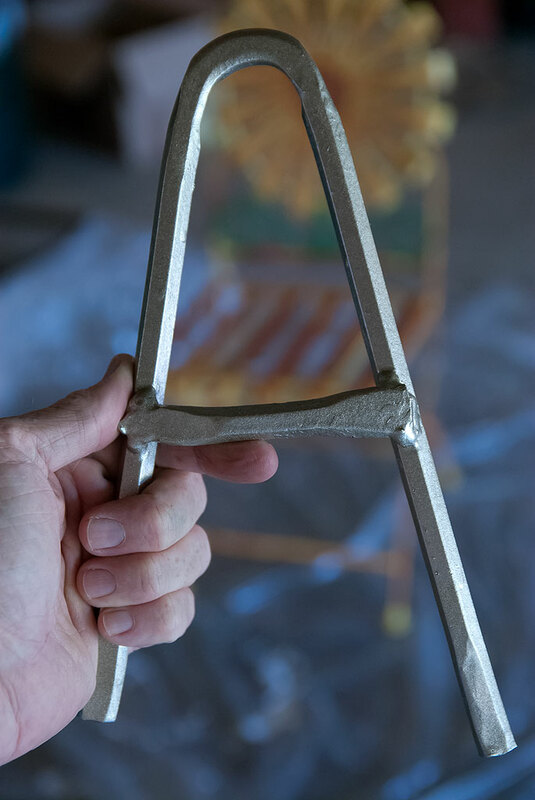 Abby’s cousin Donald Ashford made this “A” for her in the Shoffner forge at the 2011 family reunion, and we recently painted it silver. Abby picked a color called “Santa Fe” for the front and back doors and other small items. The Summer of Antennas has given way to the Autumn of Construction. As I put the finishing touches on our new front porch and deck and begin work to restore the back deck, sand and paint the various accessories, and ponder building target stands with the remaining lumber, I find myself examining my skill sets. Each of us has a unique skills, some from our experiences and some from our nature. I, for example, am very good with computers, while I am a very poor carpenter. I am good at organizing and motivate myself well to complete tasks, especially if I am comfortable with them. I am a safe pilot. I am a good outdoorsman, but a mediocre athlete. I hold science in my mind fairly well, including medical science, and as a result I have always been a good patient advocate for my wife, who is in poor health. I am surprisingly bad with names, though I use that skill in my work every day. I understand electronics and electricity to a certain level. These are my sanders. I named them Barry and Bernie. 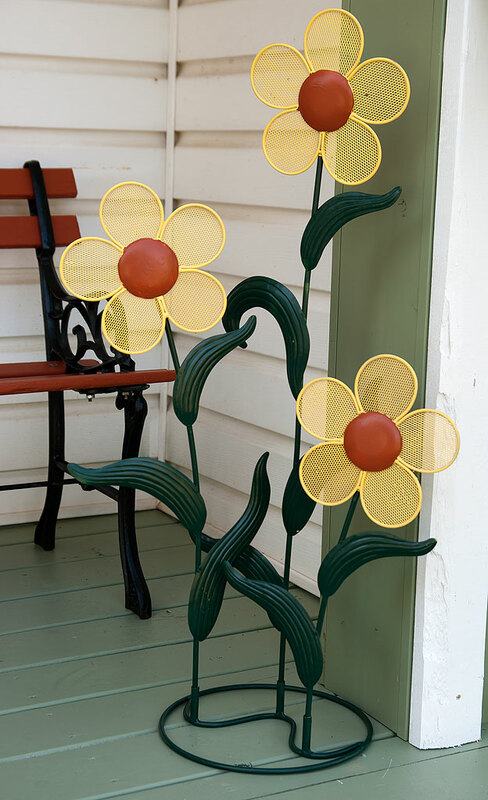 Abby and I repainted this metal flower decoration by her design, and we both think it looks very cheerful. 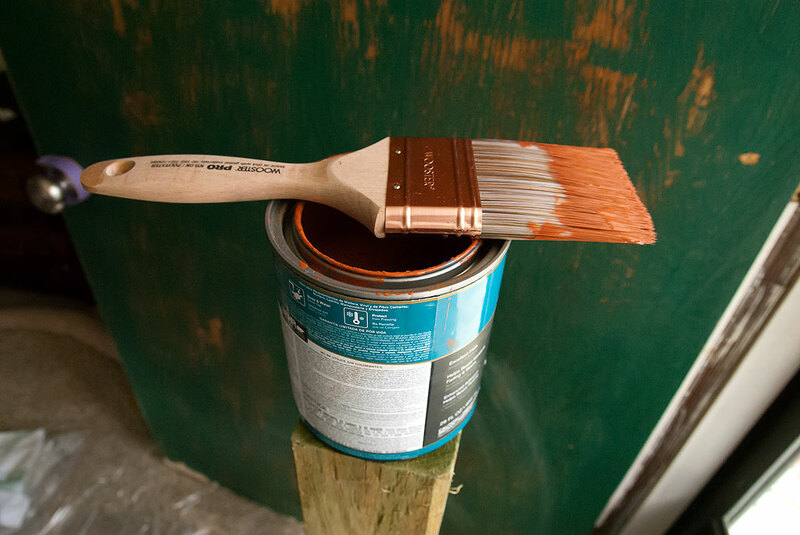 How to paint, including adding knowledge of which paints are best for what. How to square and level boards and beams. 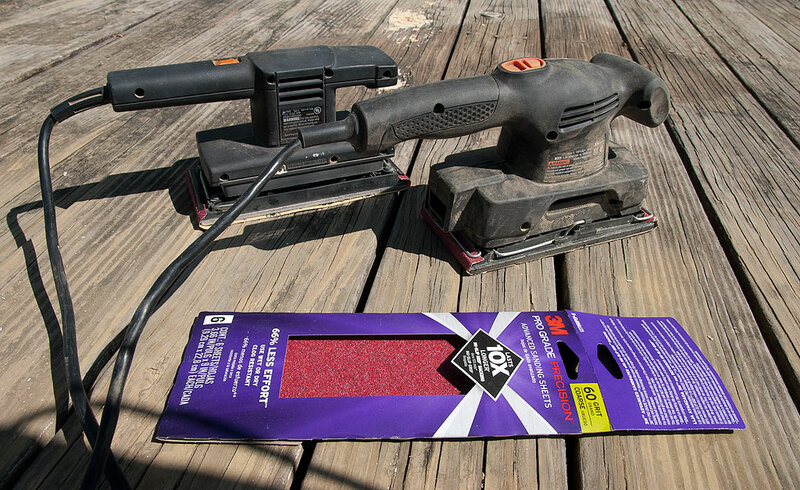 How to sand and refinish outdoor surfaces. In the past three days I have worked outside for many hours at a time, and have had great fun. It’s been particularly rewarding to use items leftover from construction of the front deck to repair and rebuild the back deck. It’s also fun when Abby joins me, which she did yesterday to paint some her chairs and flowers. 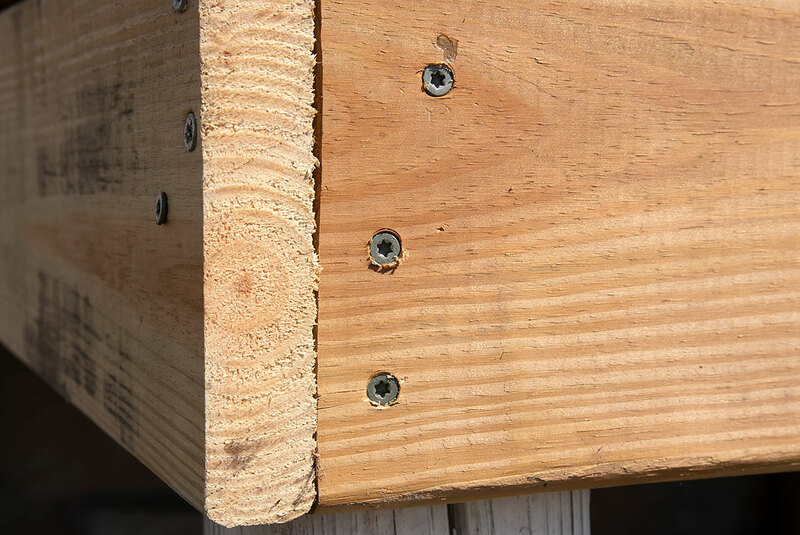 One thing I have learned in my budding young carpentership is that I love these outdoor screws with a T-20 star head. They are as much better than Phillips head than Phillips head is better than flat head. 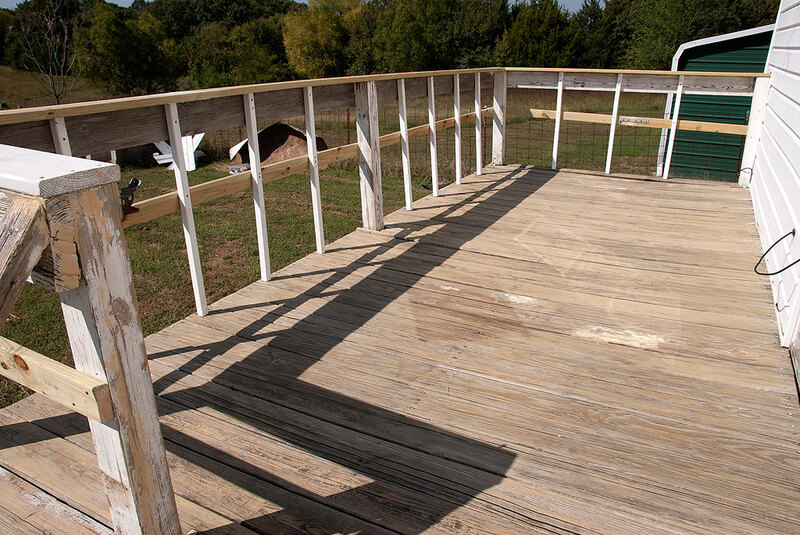 This is the back deck yesterday after I added railing, balusters, and structural reinforcements and sanded the whole thing. I primed it all last night, and hope to paint this evening. I myself have considerably fewer talents (outside of a newspaper office) but one of the things I’m teaching myself is the guitar. I bought a beginner and have learned a handful of basic chord formations. So very impressed with all of this! Tracey is going to love talkin’ hardware with you! I agree with you so much that it hurts about the star-head screws. Having built/installed quite a few things around my house in the past six years, I can attest that these are so much better than Phillips-head screws — to the point that I’m angry anyone even manufactures the old-style screws anymore. I also like the ones with inset hexagon shapes, though those aren’t *quite* as reliable as the star shapes. I have a few with triangle inserts as well, and those are nice also, but difficult to find drivers for. All your work looks great. And it does feel nice to add to existing skill sets.